So you have found a spacious apartment in a lovely street at an affordable rental price. Congratulations! You are ready to move in and show the place to your friends. But life is unpredictable. A hurricane strikes or a burglar has his eyes set on your apartment. We don’t really expect things to happen to us until they do. What Does Renters Insurance Cover, Actually? The aftermath of unfortunate events can be quite painful to move past, especially when the cost ranges in the hundreds or thousands of dollars. Not an easy affair for a college student or a young professional. And if you are short on money, you might end up pleading with somebody to borrow the amount you need — something you’d rather avoid. This is why investing in renters insurance can spare you a great deal of trouble in this kind of situations. A quick search on the internet will reveal a certain number of renters insurance carriers. You might ask yourself: why go with Lemonade? What advantages does Lemonade renters insurance offer? What is the best value for money you can get? In this review of Lemonade renters insurance, we are going to cover everything you need to know not only about renters insurance in general but also how Lemonade is changing how insurance works. Click here to check your rates in 90 seconds with Lemonade and see if you can pay as low as $5/month! Thinking that everything inside the property is covered by the landlord’s insurance is a common misconception among renters. The truth is that the landlord’s insurance will cover normal wear and tear of his property, like worn carpets or ceiling leaks. The damage incurred to the property must be the result of depreciation or outside causes like weather, and not accidentally or deliberately caused by the tenant as well as his pets or guests. So when a tenant breaks a window or his dog rips the carpet, the damage will naturally fall under his responsibility. In addition to that, a tenant will be responsible for his own contents, so if you don’t have renters insurance and the apartment you live in burns down, all of your possessions that are destroyed in the process are gone for good. And the cost of acquiring new items can easily become overwhelming, starting with your mobile phone and computer. While renters insurance cannot bring back the unsaved project folders in your laptop or the sentimental value of a keepsake, it can help you recover from the financial cost of lost possessions and legal liabilities. Imagine having to pay for items that are not your own simply because you forgot to shut off the water control valve. Nowadays, many landlords require their tenants to have renters insurance and include a clause for it in the lease agreement. You can miss out on great and affordable apartments if you are not insured. So if your landlord requires you to get renters insurance, you might as well pick the best you can get. Fire: if your belongings go up in flames, your policy will cover for their actual value. Theft: all your stolen possessions are covered, even if the theft happens outside your place. Water damage: water damage and freezing are covered, but keep in mind that flooding is not. Vandalism: if hooligans break your window for fun, or a burglar destroys your possessions on top of stealing some, you can file an insurance claim along with a police report. Smoke: smoke coming from your or a neighbor’s apartment or will damage your contents, and professional cleanup expensive can be quite expensive. Personal injury: if a guest comes to your place and somehow gets injured, your policy will cover you in case you are held legally responsible for the accident. Temporary living expenses: while the damaged house or apartment is being repaired, renters insurance will cover your hotel, food and other expenses. Electronics: camera equipment, TV, tablet, computer etc. One of the misconceptions renters have about renters is that they think their belongings are not worth the coverage. But we sometimes forget how expensive the items we regularly use can be. Losing a TV screen, clothes or a video game console is more likely than not to hurt your pocket. Between 2006 and 2016, renters became the majority population in 22 big US cities. Due to the economic circumstances and a large part of renters being young people with no intention to buy a house in the short term, renting in the United States is not expected to take a dive any time soon. A poll conducted by the Insurance Information Institute in 2016 revealed that 41% of renters had renters insurance. But this number is likely to rise since more and more landlords are requiring renters insurance from their tenants to cover them for unfortunate events. Another myth surrounding renters insurance is that it is expensive. Fortunately, you don’t need to pay a fortune for this type of insurance. The average annual cost to get insured is less than $200. Renters insurance takes into consideration the fact that most renters tend to be on the younger side. In fact, in 2016, 50% of US renters were under the age of 30. Lemonade offers rates that are on the lower end of the industry average. With $5 per month, to say it is affordable is to put it lightly. For the price of a cup of coffee, you protect yourself from the cost of lost belongings. You can check the Lemonade rates here. In addition to the affordable rates, Lemonade also offers Zero Everything, the feature that allows you to file a claim with no deductibles. You won’t have to worry about not getting your claim paid out because an item’s value is lower than a deductible – a common hassle among insurance carriers. While this unique feature not currently available in all states, it will gradually cover the whole nation. Traditional insurance has a history of conflicting interests between customers and insurance carriers. Basically, an insurance agency will look for reasons to deny a claim. It is a win-lose situation: whether the customer gets his claim approved or not, one of the sides loses money. For many people, calling their insurance agency after an unfortunate event is synonym with back-and-forth headaches, lengthy investigations, and uncertain outcomes. Given the possibilities opened by technology, the insurance industry is well due for a shake-up. The Lemonade team seeks to relieve customers from their usual pains by delivering fresh, efficient service. To do this, Lemonade reset the whole insurance business model and came up with a solution where everyone wins: you, us and society at large. In a nutshell, Lemonade takes a flat fee and the rest of the money is considered to belong to the customer. It is used to pay out claims and gives the leftover unclaimed money to charities that customers choose. That way, not only you ensure coverage for your possessions but you also contribute to social impact. Take note that roommates are not covered by your policy. However, a policy can include your spouse, relatives and adopted residents, at no additional fee. Lemonade leverages the convenience of today’s technology to provide an effortless customer experience. No need to deal with brokers who inflate your expenses anymore. You also don’t need to make a phone call or send an email to assess your options. You simply click here to get a quote and set up your policy right away on a simple, clean interface. The biggest advantage of Lemonade is that you can get insured on the fly, no matter the time or place. The process for creating your policy is quick and straightforward. You are asked simple questions and, based on the information you provide, you are given a personalized, accurate policy. Likewise, filing a claim is just as easy; you provide the necessary information and you are good to go. You don’t want to waste time and money on phone calls and intricate procedures. 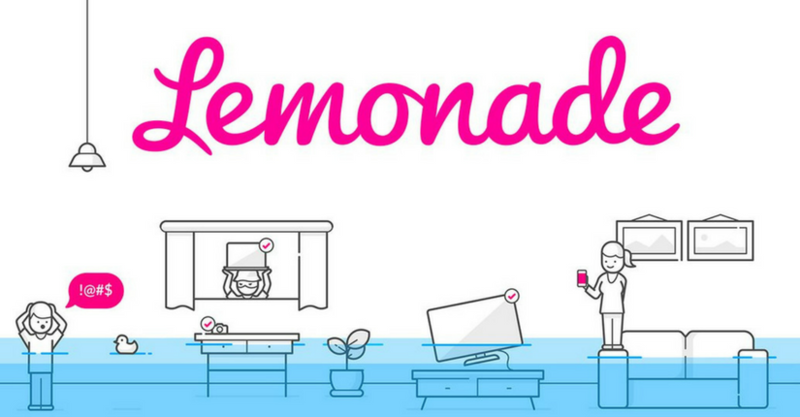 With Lemonade, insurance meets FinTech in a fizzy combination. By using the intuitive mobile app, you pay faster and with less hassle. The same goes for claims; the majority will be paid out instantly, while particular cases will be handled by the Lemonade team in as little time as possible. Lemonade provides a faster, easier experience that allows you to leave hazards behind and move on with your life. Another aspect that Lemonade is keen to provide is transparency. The team shares periodic pieces about Lemonade’s overall performance, complete with statistics and milestones as well as ups and downs. This way you can stay updated on the journey of changing how the insurance system works. As mentioned above, the leftover money from policyholders goes to charities of their choice. This unique feature is called “Giveback” and sets Lemonade renters insurance apart from the rest of insurance carriers. The value created does not stop at covering for a person’s losses but extends to society. Thus you can contribute to causes you care about like education, equal rights or the environment. The best way to deal with unforeseen events is to anticipate them. Accidents have a habit of popping up when you least expect them. Some areas are struck by natural disasters every year. Saying “But I don’t have renters insurance” will do nothing to dissuade lawyers from holding you responsible in case someone decides to sue you. Likewise, a landlord cannot do anything for you if you lose your possessions. As a general rule, do not expect anyone to cover for you out of kindness. So as an independent person, you have to plan ahead for the many potential hazards in life. By taking preemptive measures against worst-case scenarios, you develop self-reliance, personal responsibility and the sense of anticipation. For instance, paying medical bills for someone who got hurt in your apartment is a painful lesson that you are better off learning in theory alone. Getting renters insurance is all the more important if you have household residents like a spouse or a child under your care. Lemonade renters insurance provides coverage for not only you but also residents related to you by marriage, blood, or adoption without having to pay more. To avoid these undesirable outcomes, it is better to take a proactive approach and enjoy peace of mind knowing that lost personal property will be replaced in case of an unfortunate event. In this review of Lemonade renters insurance, we went through the necessity of renters insurance in today’s world, how landlords are not responsible for your personal losses, what renters insurance covers, and how, for a cheap price, you can get insured on the fly, thanks to the easy-to-use Lemonade app. If you want to protect your belongings and avoid burdensome costs, get your renters insurance today.